My first Morris Minor after 50 years of driving! 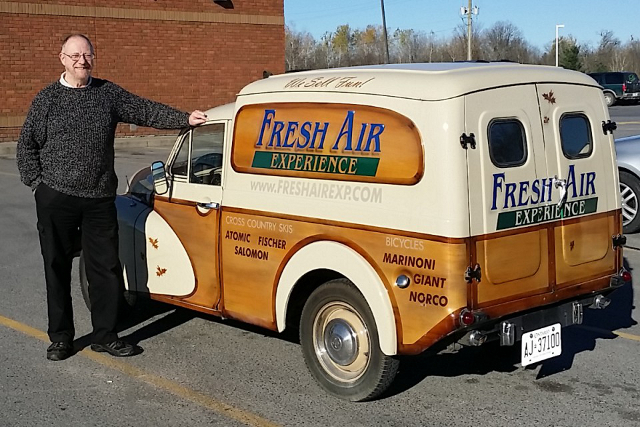 My wife, Jan, and I drove to Ottawa on October 22nd where the deal was closed after confirming that the van was as nice in person as it appeared in the pictures. We then drove home to Owen Sound, Ontario (624 km., 388 miles) the next day with no incidents but many smiles. The picture above was taken at one of our coffee breaks. After an all-too-brief week of local driving, I put Elsie away for winter storage a day before the snow arrived and the roads were salted. 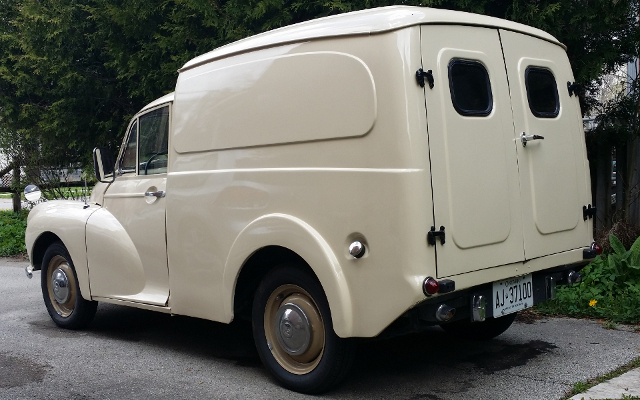 First job in the Spring is a complete respray in plain beige to remove the advertising, followed by adding to the 43,630 miles she currently shows. Following some fettling (including new tyres, hoses, gaskets, and a clutch rebuild) Elsie is now enjoying a new lease on life.